If there is such a thing as a perfect fund raising idea, this is it! This is a demo version that is limited to printing the first ten tickets and calculating winners for the first two weeks. There is no time limit (days), or no maximum number of runs. All screen functions can be exercised. For the steps involved in running a Football Chance fundraiser as shown in the "SUMMARY" Section on the home page, the demo program can be used to complete the first three steps (1, 2, 3). File size is about 2.6 MB. Once the demo program file (SETUP.EXE) has been downloaded, double click on the file to execute it. The setup program will guide you through the necessary steps. A convenient place to temporarily store the download is on your desktop.There is no need to save the demo program file (SETUP.EXE) since it can be downloaded again, if necessary.So after installing Football Chance, right-click on SETUP.EXE and select "Delete" to remove the downloaded executable file from your Desktop. If no problems were encountered (program works OK), then run the setup program. The current use data file will be retained, and data you entered will not be lost. Uninstall the program if problems were encountered, namely, Run-time error 55 - File already open. Click on Start > All Programs > Football Chance > Uninstall. Then run the setup program. 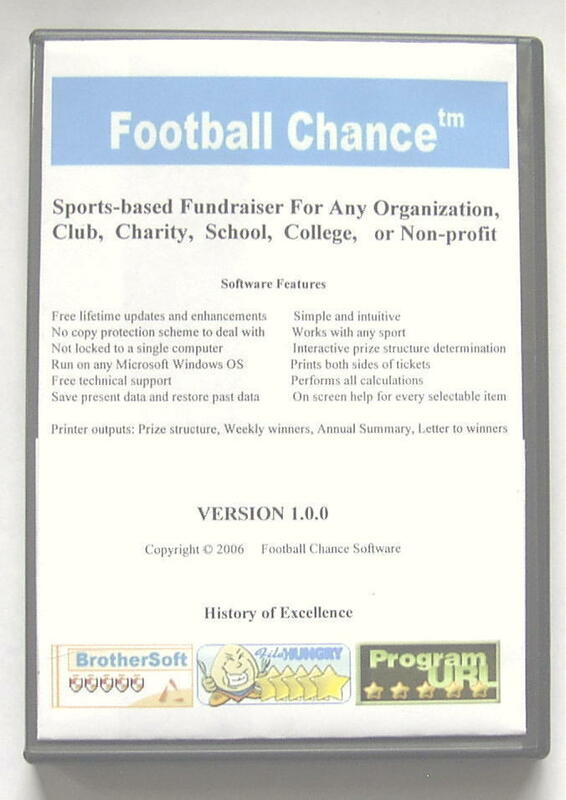 The cost of the Football Chance demo software, mailed on a CD-ROM, is $6. A 6% sales tax is applied to VT purchasers.